We spoke to an Intel representative this morning who confirmed that the seriously powerful top-end Intel Vega M isn’t just going to be limited to miniature desktop machines like the new Hades Canyon NUC. That’s exciting stuff as it should make for super-slimline notebooks with the gaming power of a GTX 1060. You might want to plug one of the new Intel Vega M machines into one of the best gaming monitors around. Nvidia’s GTX 1060 is an 80W TDP graphics chip in standard trim, and maybe around 70W using the Max-Q design, but you’re still talking about that having to be paired with an H-series Intel CPU with a 45W TDP. 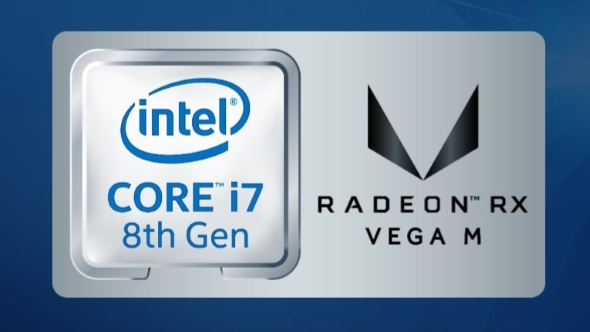 We were initially concerned that Intel were only talking about the 24 compute unit (CU) Vega M chip being used in their upcoming Hades Canyon NUC, so it’s definitely pleasing to know that it’s going into laptops too. There are at least two OEMs working on machines with the Core i7 8709G processor inside it, and they should appear this year with the NUC arriving sometime in March. 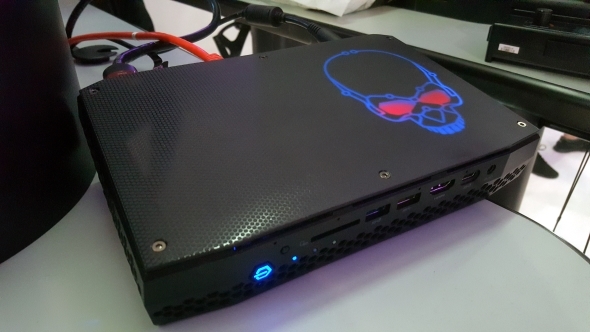 They’ll be some powerful VR-capable thin-and-light notebooks too, judging by how well the Hades Canyon NUC delivers on the promise of smooth VR gaming. I had the opportunity to mess around in zero-G with Echo Arena this morning and the game ran beautifully on the new NUC at its stock settings. I have to admit I was sceptical about just how well it would be able to cope with the rigours of VR, but even with early Intel blue-skinned Radeon drivers it was solid, smooth, and mercifully lag-free. The last thing I wanted to do was vomit up my breakfast in a packed CES booth. And because the Hades Canyon NUC is running the Core i7 8809G it’s all overclockable too, and they’ve designed some thermal headroom into the Hades Canyon cooling design to allow for it. You can tell that as soon as you pick up the NUC because it is one weighty beast, and feels like it’s a touch heavier than an Xbox One console, despite being at least half the size. They still haven’t given any hint as to the pricing of the thing but it ain’t going to be cheap. 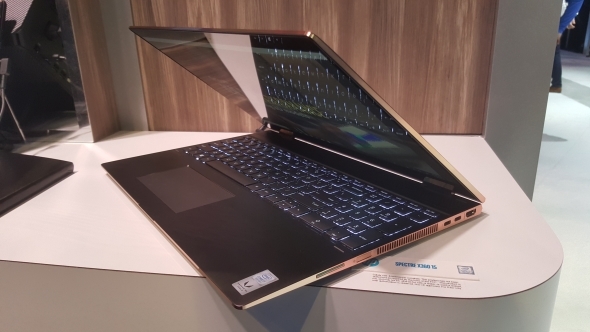 When the beautiful HP Spectre X360 15 is some $1,400 with the lower-spec Core i7 8705G, you know the NUC is going to seriously pricey.